Today I visited Spike Island for their annual Open Studios event. The event did not disappoint! My friend Hayley and I took part in an experiential piece of art where she made a cup of tea and I sat in a tent, we admired many studios and the art work inside and we spent a significant amount of time creating in the open activity space. Art and Power dotted Creative Challenges throughout the building and I met Jeff, who works for them and is also known for being a Bristol Gig Legend. Jeff told me about a mail project that he was working on, writing letters to musicians. 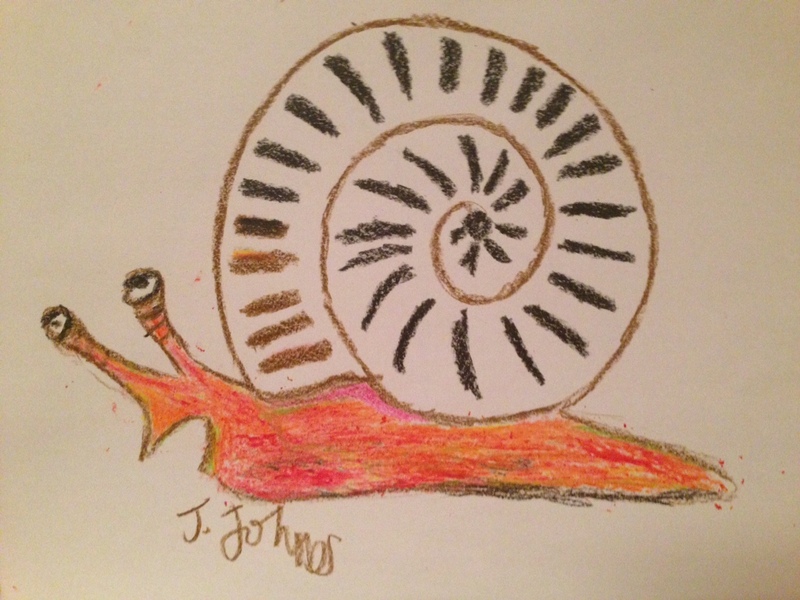 I told him about the ‘Send a Snail in the Mail‘ project and asked if he would draw a snail, to which he kindly obliged. 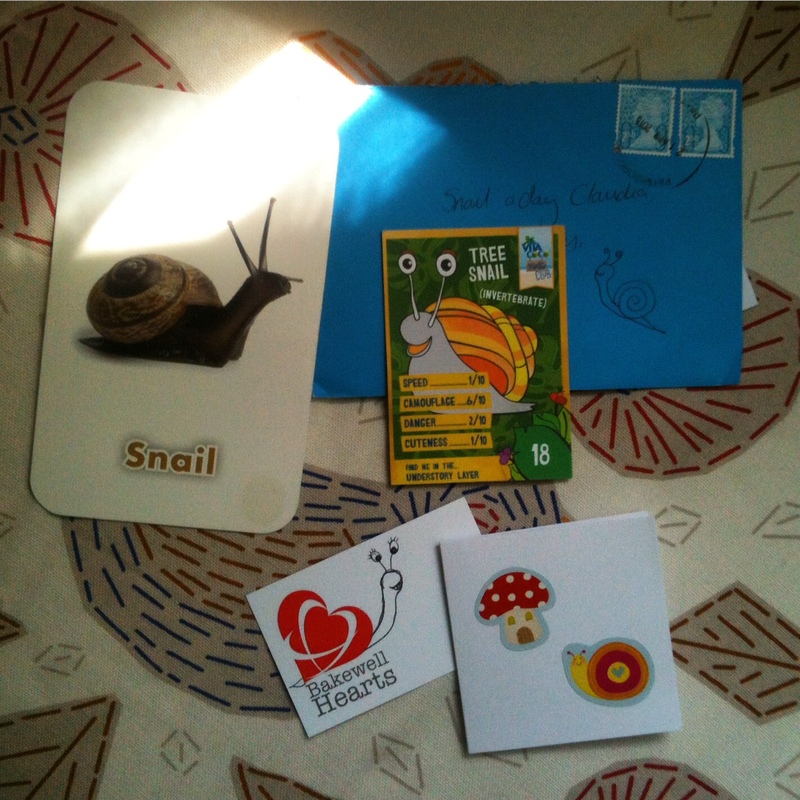 This week several snails came gliding through the letterbox. GLIDE – to move smoothly and continuously along, as if without effort or resistance. Although these snails came gliding through my letterbox, I am by no means implying that they came as easy as the word glide suggests. The journey of each snail is one of significance. 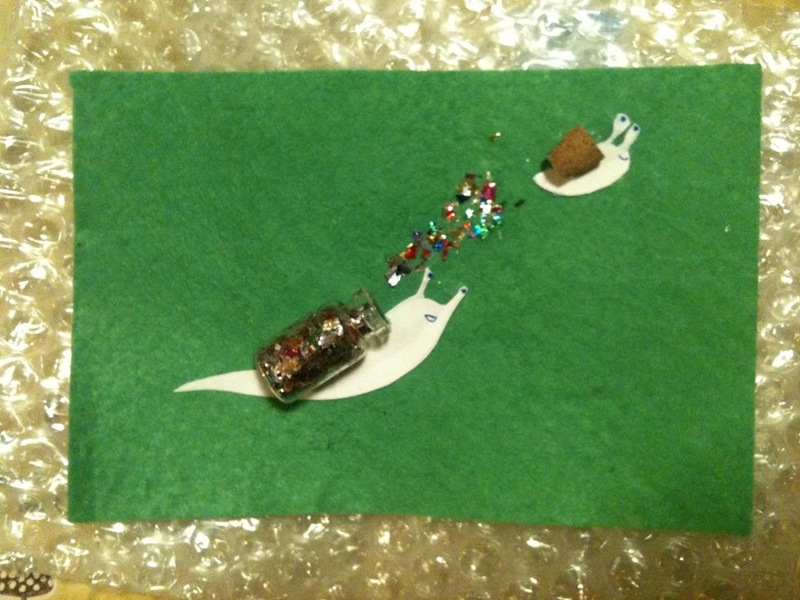 I am not sure this completely makes sense but hopefully the snails will help explain – they each have a story to tell. Thank you from the bottom of my shell for sending a snail in the mail. – I hope that each snail continues to act as a puzzle piece and can spread sillyness, thoughtfullness and a way to help us glide! This chap came from Berlin via Devon and is by the super talented illustrator Jayde Perkin. 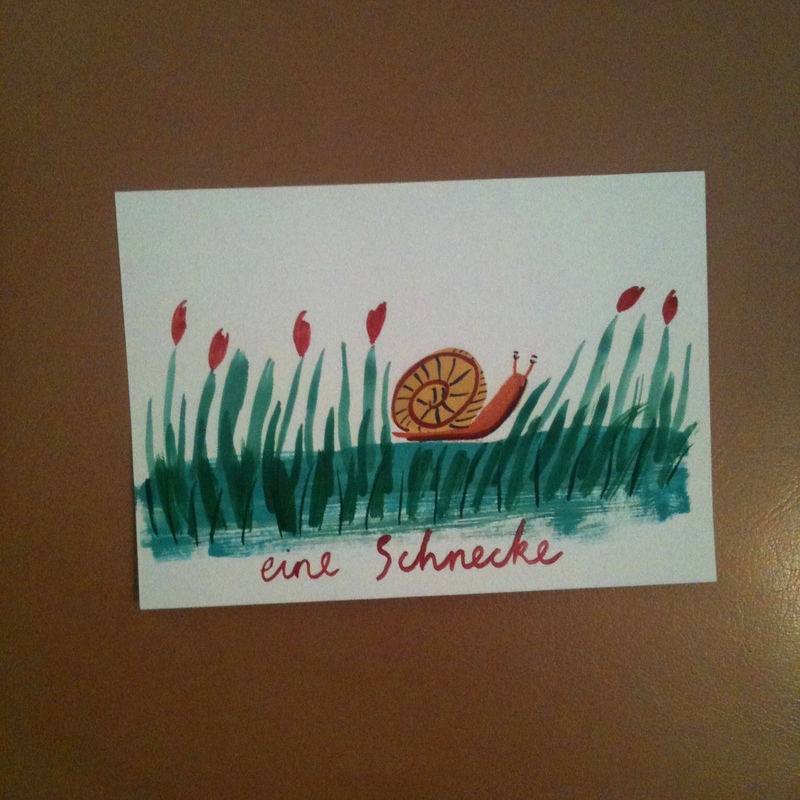 Eine Schnecke looks like he has a lot of character, just like the people that Jayde illustrates. This bright delight is by Ritamae a lovely lady that I used to go to school with. 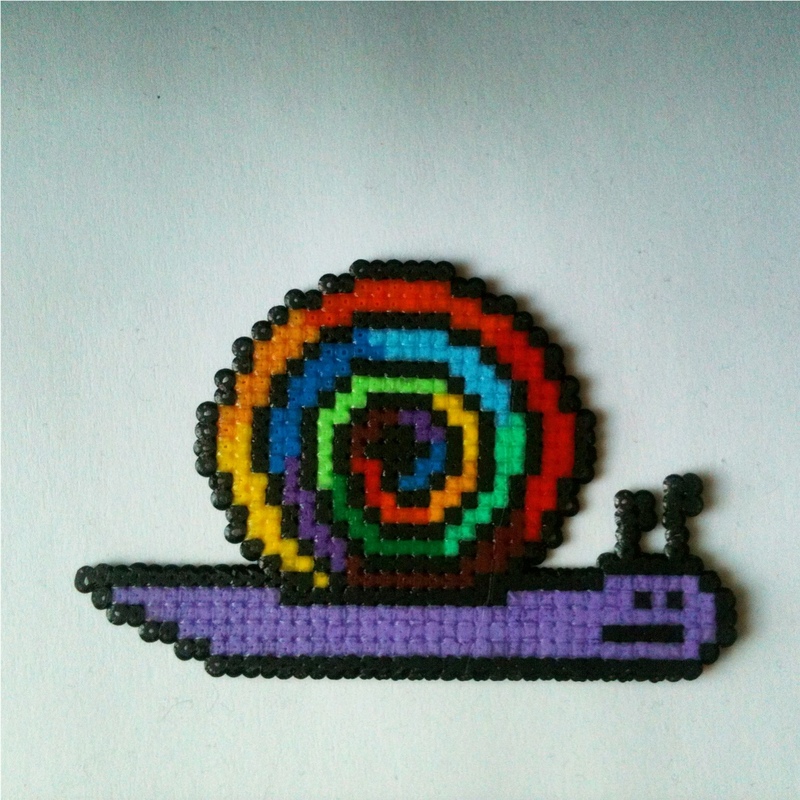 A rainbow came through the letterbox with this snail! These chaps were gathered by Bakewell Hearts a fellow snail lover that I follow on Instagram. She makes wool Batts which are rather whimsical and snail like! My friend James just sent me this cheeky chap! I guess snails are pretty cheeky, especially when they eat your plants! I heard that their favourite plant to eat is a Hosta! What do you do to protect both plants and snails in your garden? 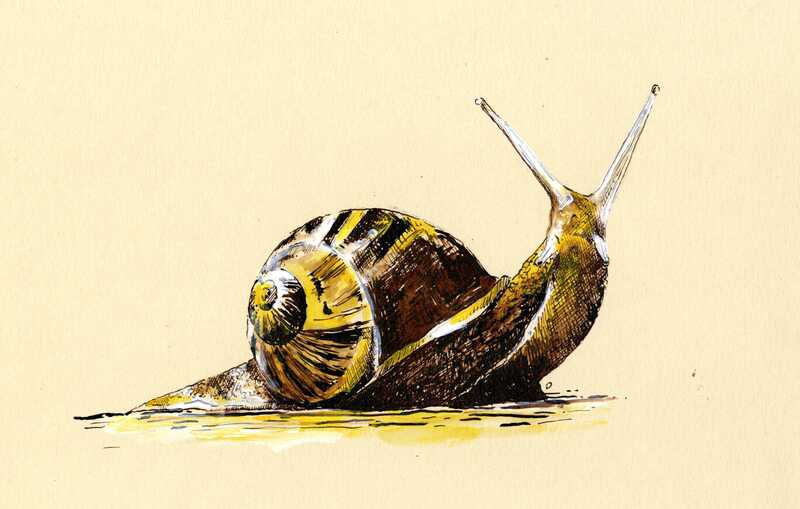 I know someone that carefully rehouses the snails by driving them some distance down the road to the local nature reserve. The Snail of Happiness indeed! 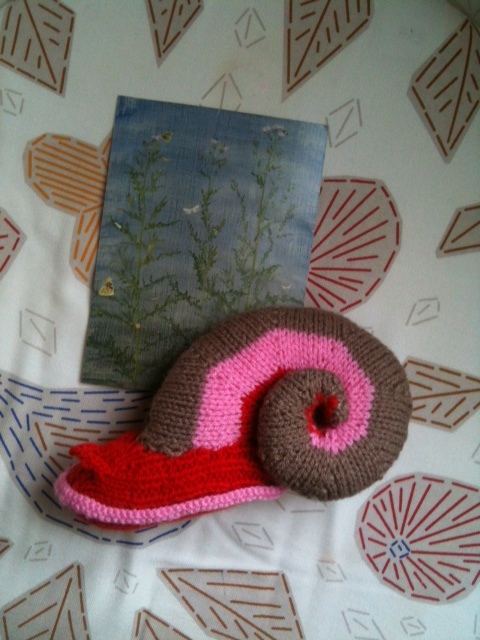 On Friday I received this fabulous fellow from Jan who writes The Snail of Happiness blog. Casting on, choosing wool, counting stitches and creating a masterpiece – Knitting is something that brings happiness to many. This snail in particular got me thinking about the exhibit and how and why I want to display 365 snails. The answer of course is HAPPINESS. Not just my own, but hopefully the creators and viewers too. Whilst I was in Canada I did a course in ‘Creative Nature Connections‘ taught by Lisa Lipsett at Royal Roads University. The course sounded interesting but one of the main reasons I signed up was to meet people. There was only a few of us and we spent most of the day with our eyes closed and our fingers in a paint pallet. At lunch time I got talking to Helga, I told her about my daily snaily and she told me about her heart a day! We become friends for the few months that I spent in Victoria. I got to see her showcase her hearts at a local gallery and spend time creating with her. Last week I received some snail mail from her and it came just at the right time. I’d been having a particularly tough morning and as I left the flat the post lady handed me the most wonderful package I ever did see. 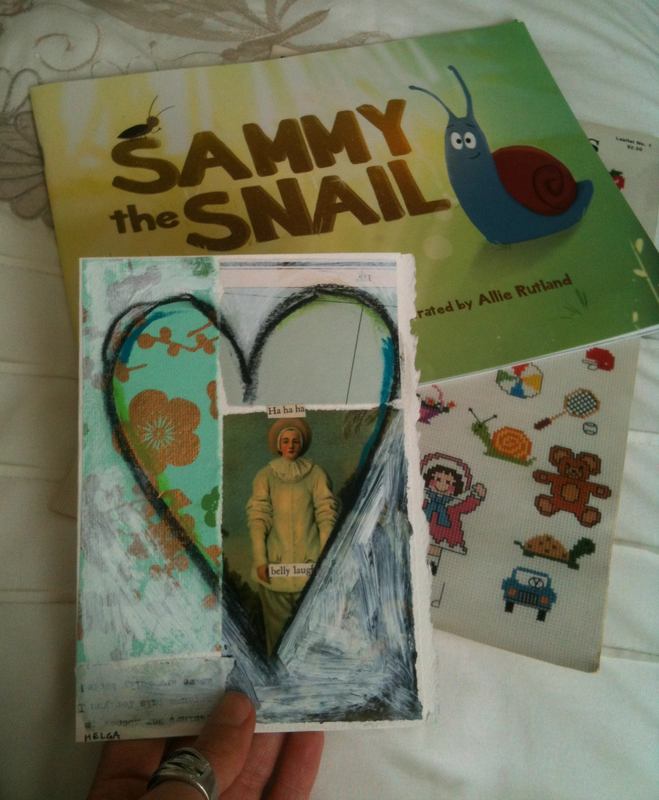 The story of Sammy the Snail, a tale of a snail who overcomes sadness brought tears to my eyes and the card with the words ‘hahaha belly laugh’ collaged within a heart reminded me that the feelings of my morning were temporary. I don’t know about you but when I receive a postcard, package or personal letter in the mail, I feel special (even if I did order it myself on the internet). Glitter bottle and Pop dropped through my letterbox yesterday. I hope that 13 year old Nell (soon to be 14) – the artist and creator of these marvellous mollusks felt just as special making them as I did receiving them and I hope that YOU feel special too because these snails are rare to find and are one of a kind.